After weeks of back-and-forth between the Department of Justice and Apple (s AAPL), the federal judge overseeing the ebooks antitrust case issued an injunction against Apple in a filing released Friday. The Department of Justice will be happy, because the final injunction contains a lot of what it had asked for. In July, Judge Denise Cote found Apple liable of conspiring with publishers to set ebook prices at the launch of the iBookstore. The injunction, which is set to go into place in 30 days, will last for five years — but the court can extend it for “one or more one-year periods” after that, either on its own or at the request of the DOJ or the states. Apple may seek a stay of the injunction pending its appeal. The DOJ cheered the decision: “The court’s ruling reinforces the victory the department has won for consumers,” DOJ antitrust assistant attorney Bill Baer said. Judge Cote’s injunction forbids Apple from enforcing most-favored-nation clauses in any ebook publishing contracts for five years, and also forbids the company from entering into any book publishing contracts that contain them for five years. Apple had wanted this provision to be less broad, relating only to MFN clauses with the five publishers in the case who have already settled. Instead, it applies to all publishers. 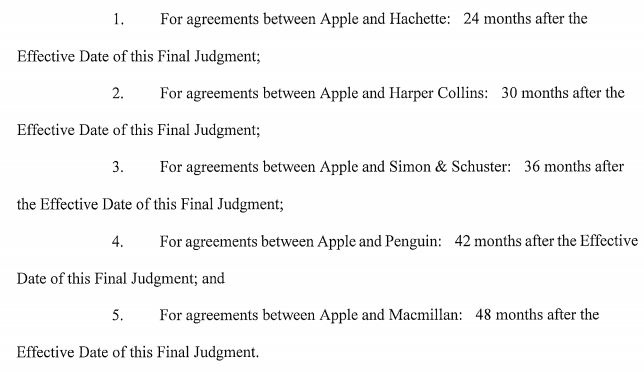 As expected, Judge Cote will require Apple to stagger new contract negotiations with the settling publishers — HarperCollins, Hachette, Simon & Schuster, Penguin and Macmillan. As part of their original settlements, all of those publishers were required to enter new contracts with retailers that allowed the retailers to discount their books for two years. While those agreements are already under way, the clause in the injunction will significantly extend the amount of time that they’re required to allow discounting of their books (not just in the iBookstore but, in effect, with all other retailers). For two years, Apple will be monitored by a court-appointed External Compliance Monitor to ensure that it complies with the terms of the order. Apple can suggest candidates for the position. It’s not too hard to see just how zealously the DOJ’s lawyers were looking after the interests of Amazon in their demands. Stringing out negotiating new contracts with these publishers over the next four years makes no legal sense. Begin them all now, but insist on secrecy, and there’d be no collusion. String them out, one after the other, and industry gossip, particularly in a city like Manhattan, will mean that each enters knowing the substance of the agreements of all those who’ve gone before. Stringing the negotiations out will, however, make it harder for Apple to compete with Amazon. It will also make each of these publisher more susceptible to pressure from Amazon. And that, I suspect, is its purpose. Also, what sense does it make to force each of these publishers to negotiate a separate contract when, for virtually every other publisher on the planet, both Amazon and Apple offer a fixed and unchangeable ‘take it or get lost’ contract? If the DOJ and the court really wanted to level the competitive playing field, it could insist on having one contract that applied to every publisher, large or small. The approach being ordered almost certainly means that each of the Big Six will get much better contracts than the Little Thousands. The fact that each of the six might get contracts that are better in different ways matters little. Oh how I loathe these DOJ lawyers! AAPL was childish to fail to negotiate after all the publishers settled. Either arrogance or poor legal advice – it could have gotten off with two years of restrictions but now has five. What’s the point of forcing the negotiation order? HarperCollins, Hachette and S&S settled with the DOJ right away, back in April 2012. Macmillan and Penguin planned to take it to court and fight alongside Apple, before also settling months later. I think the order is a way of punishing those who settled last. I think the judge made one mistake. She should have forced Apple to use an even playing field for in app purchases of books. If Amazon, BN and others can’t sell books through the app, then neither should Apple. When I still used iOS, that was a compelling option for iBooks. Since I’m no longer on Apple, I have that feature in Android and Windows 8. It’s definitely preferable to having to go to the web. Yeah, it would be good if Apple were profitable and unique. Apple isn’t stopping anyone from selling ebooks through their apps, it just requires that payments for such content go through their in-app payment system. In both Apple and Google’s cases the in-app billing service takes a 30% commission. – where payment is for digital content or goods that may be consumed outside of the application itself (e.g. buying songs that can be played on other music players). So as long as the eBook can be consumed outside of the application doesn’t have to go through in-app purchase on Google Play. Next up, appeal by Apple. Get the popcorn!